WHAT IT’S ABOUT: (SCROLL DOWN TO READ AN EXCERPT). 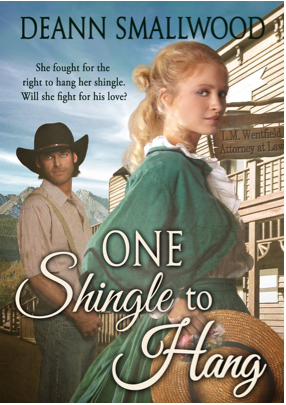 CONTINUING OUR REVOLVING BOOK SPOTLIGHT on DeANN SMALLWOOD, TODAY we feature the western historical romance ONE SHINGLE TO HANG. GET IT EXCLUSIVELY ON AMAZON! CONTINUING OUR REVOLVING BOOK WEEK SPOTLIGHT on DeANN SMALLWOOD, TODAY we feature the western historical romance ONE SHINGLE TO HANG by DeANN SMALLWOOD.